What’s this? A mysterious package arrives at Longbox Graveyard Secret Headquarters! (Actually, it’s not a surprise at all, as I ordered it. But I pretend otherwise. Coy self-deception is a survival trait for comic book bloggers). (Nice of this eBayer to go to such bother. I would have just tossed the thing in a box). And within that wrapper, within that box … it’s the Mole Man! I was all set to tear the box open … but this is a pretty cool box. I particularly liked the “Then & Now” information panel that made up one side of the box. Ah, but “WHY Mole Man?” I hear you ask. Why did I buy this bust? I don’t particularly like Mole Man, and I don’t collect busts. I’ve sold off or given away nearly all of my comic book stuff. Yet here I’ve purchased a Mole Man bust! Don’t blame the Value Stamp per se (though a different Value Stamp cost me my copy of Hulk #181 … that’s another story). 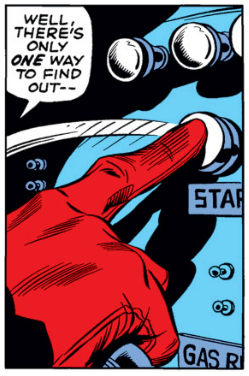 No, blame that portrait of the Mole Man, excerpted for a Value Stamp. You see, when I set up this blog, back in the dim days of 2011, I set up a Twitter account to go with it, and Twitter required an avatar. 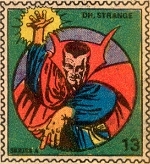 Child of the Bronze Age as I was, I “naturally” flashed on using a Marvel Value Stamp. I scrolled through the invaluable on-line listing of Value Stamps and settled on one that was a portrait with a good “read” and a funny expression: Mole Man. Not really thinking more about it, I took to Twitter as the Mole Man. Of course, if you follow me on Twitter … all you see is that damn Mole Man face. With no small degree of regret, I admit to 27K-plus Tweets on Twitter. That’s a lot of Mole Men! OK, so I’m the Mole Man. I can go with that. With my avatar thus afforded the legitimacy of an individual’s artistic expression, I’ve come to embrace the Mole Man. First, I did a Pinterest Gallery for him. This is not to be scoffed at! I’ll have you know that I’m the FIFTH MOST INFLUENTIAL MAN ON PINTEREST! Then I wrote an impassioned plea for why Ian McShane should play the Mole Man on film. But, really, those were baby steps, leading up to owning my very own Mole Man bust. I’ve been looking for this bust for years. Really! Yes, I know it is readily available on eBay. That’s where I got it! But I set strict rules for the acquisition of my Mole Man. Specifically, I wouldn’t pay more than twenty bucks for it. I spent the last two or three convention seasons hunting for Mole Man on dealer floors up and down the west coast, but never found my quarry (and the prices, overall, of these Bowen Designs statues were not encouraging). So when I found a slightly damaged version on eBay, for $14.00 shipping included, I pounced like a ravenous Moloid! And now Mole Man resides in a place of prominence on the bedroom deck that doubles as my office in my new beach condo digs. … I AM THE MOLE MAN! Posted on May 13, 2015, in IT COMES IN THE MAIL and tagged Bowen Designs, Marvel Value Stamp, Mole Man, Twitter. Bookmark the permalink. 6 Comments. Don’t feel bad…I’m starting to look like Thanos! 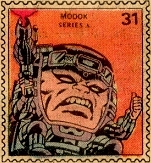 It’s when you start to look like MODOK that you need to worry.